You can find my film review here. Moss lives in rural Texas, and hunting one day, he comes across a drug bust that has gone bad. Many men are dead, one dying and he tracks the one who almost got away and takes a suitcase with a large amount of money. Back home with his wife, in the middle of the night, his humanity overcomes him and he decides he must take the dying man water. However, the bad guys are already there, and before he knows it, Moss is their target. 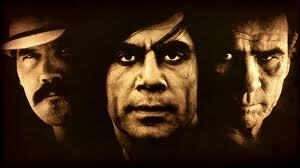 He sends his wife away to her mothers and runs, but is unaware that he is fleeing evil in the form of serial killer Chigurh. Both are being followed by the police, in particular Sherriff Bell. 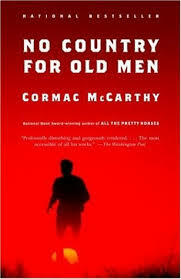 I love reading Cormac McCarthy for the sparseness and directness of his writing. It is plain and simple and so powerful. It’s one of those books that I feel it was a shame to read it after having seen the film as the images in the film are so strong that it was impossible for me to make my own pictures. However, as the film was so magnificent that I was happy for those images to be my own.